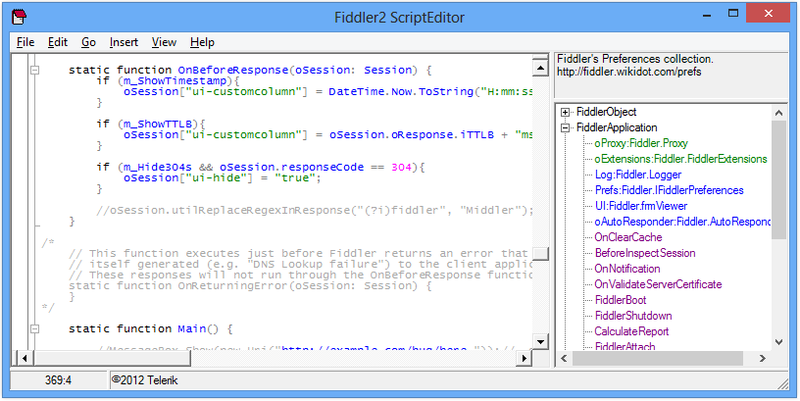 This page contains useful extensions for Fiddler. 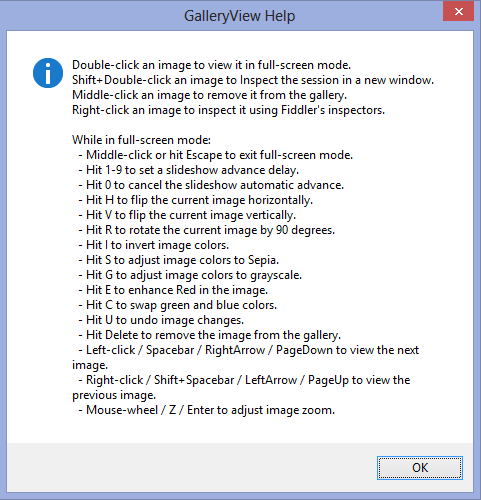 For best results, please ensure that you're running the latest version of Fiddler2. You can develop your own extensions using the IFiddlerExtension interface. Tip: If you are a Web Developer, you need the Syntax-Highlighting extensions! The RulesTab2 extension is a powerful way to edit your Rules script directly within Fiddler2. 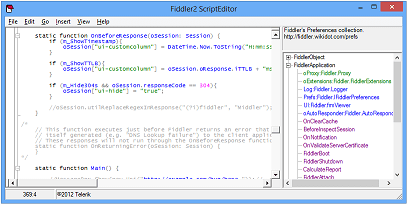 The FiddlerScript Editor is a standalone text editor that helps you edit script rules for Fiddler. It offers syntax highlighting and a Class Explorer to help you author scripts. The SyntaxView Inspector offers syntax-highlighting for HTML, JScript, XML, and other web formats. Last Updated: Oct 16, 2011. Approximately 300 times faster than the old version, and less likely to mangle poorly-formatted script. iOS devices and Android devices may not work with the default HTTPS interception certificates used by Fiddler. To resolve this incompatibility, you may install a Certificate-generating plugin that generates interception certificates compatible with those platforms. The Differ tab allows you to compare two traffic profiles. Download now ( 47kb). The Gallery extension ( 50kb) displays thumbnails of all images found among the selected sessions. Last Updated: Oct 3, 2011. Now includes a timed Slideshow mode and image effects. Click the Help link for details. The AnyWHERE extension ( 40kb) allows you to trivially spoof the responses to browsers' GeoLocation webservice queries. Works with IE9, FF4, Chrome, and Opera. Full source is included. Note: You must enable HTTPS decryption for this tool to work. The RulesTab extension is a lightweight way to tweak your Rules script directly within Fiddler2. This extension is not as powerful as the RulesTab2 extension above (no syntax highlighting or Intellisense), but it requires less memory. The Content Blocker sample ( 11kb) is a simple example of using IAutoTamper to block traffic based on URI. The Image Flipper sample ( 6kb) is a simple example of using IAutoTamper to automatically flip all downloaded images 180 degrees. This list is provided for informational purposes only, and we make no representations or warranties, either expressed, implied or statutory, regarding the items, manufacturers, or compatibility of the items available within. Some of the links below send you to sites that are not under our control. We are not responsible for the contents of any linked site or any link contained in a linked site or any changes or updates to such sites. These links are provided to you only as a convenience, and the inclusion of any link does not imply endorsement by Eric Lawrence or Microsoft. Report a problem. 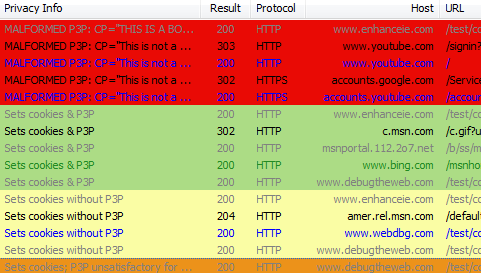 Ammonite is an web application security scanner extension for Fiddler. Ammonite detects common vulnerabilities such as SQL injection, OS command injection, cross-site scripting, file inclusion, and buffer overflows. Ammonite includes unique features that make it particularly well suited for penetration testers and security professionals. yamagata21 built this extension which allows fuzzing of Web Applications. 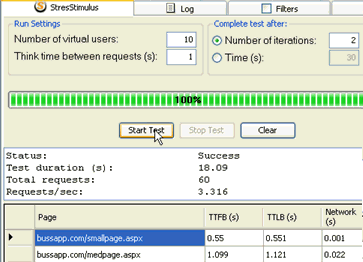 Andy Cross built this cool extension which analyzes the selected HTML response for inefficiencies. Oscar Brito's extension enables you to specify latency based on regular expressions or exact URLs. Source code is available. Dave Risney wrote the WPAD Server Fiddler extension, which is interesting for a number of reasons, although most folks will never need it. - Fedor Vlasov has written an XML Request viewer that handles x-www-form-urlencoded XML post bodies. - Joris Bijnens has written an XML DataSet Inspector which shows XML data using tabs and grids.